We're nearing the end of the month and that means that it's time for some subscription box unboxings! 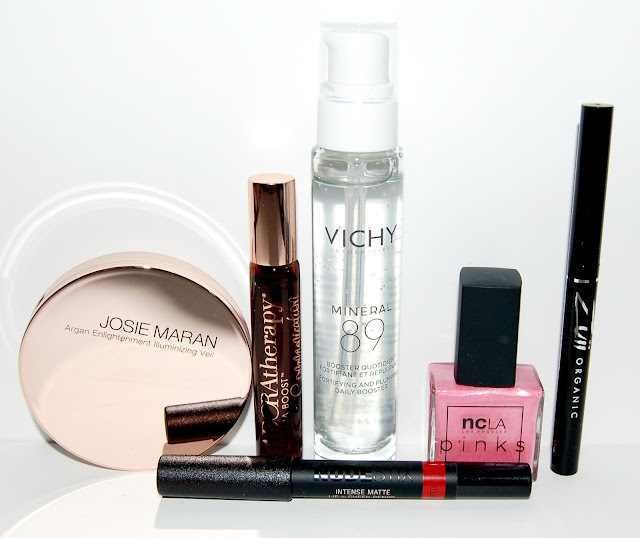 Let's start with Glossybox. Glossybox is a monthly beauty subscription service that features five luxury beauty products for $21 and free shipping. There are 3, 6, and 12 month options that will each lower the monthly price by either a couple or several dollars. The boxes include many lesser known brands and some well-known brands that we all love like Tarte, Benefit, Burberry, and Essie. I actually happened to get 2 boxes this month, the regular monthly box as well as the Limited Edition Pink Diamond Mother's Day Box. 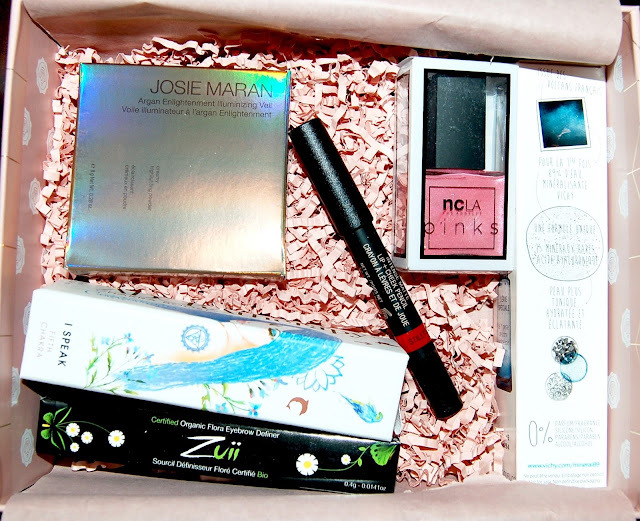 Today's post will focus on the Mother's Day box, stay tuned later this week to read about my thoughts on the regular April Glossybox. The packaging of the Mother's Day box is so pretty, delicate and feminine! 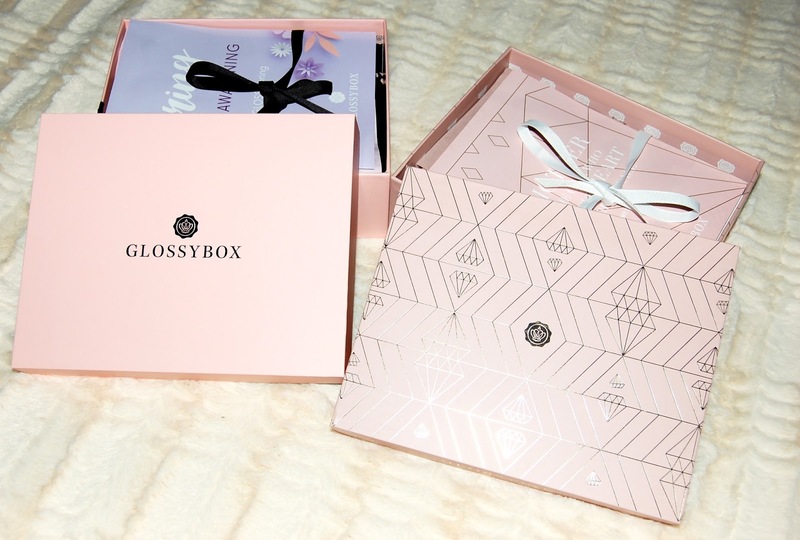 I really do love the Glossybox boxes, I've kept all of mine and I can't wait to use them! Here's everything included in this special Mother's Day box! Vichy is a well known high end skincare brand so I was excited to see a product from them in this box. This brand new product combines 15 mineral rich waters and hyaluronic acid which will hydrate the skin and make it more resilient to the visible signs of aging. I'm sure most moms (and of course non-moms) would appreciate that! This perfume is formulated with essential oils, absolutes, and gem and flower essences in a base of organic Jojoba blends as well as notes of lavender, peppermint, chamomile, sage and more. Due it's strong herbal-y scent, I don't care for this perfume. This is a soft long-lasting brow pencil with a non-greasy formula. This is a gorgeous red lip crayon that can also be used on the cheeks. This is a beautiful shimmery pink nail polish that is perfect for the spring/summer! 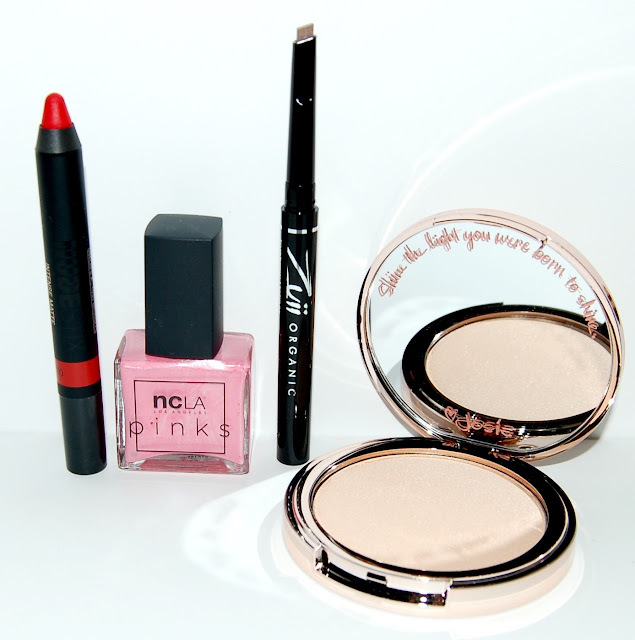 This is a silky highlighting powder formulated to a create lit-from-within glow. I can say that even in swatches, there is barely any glow or shimmer to this powder so I plan to use this as more of an allover setting powder. As you can see, this Limited Edition special Mother's Day box included all full size products! Since this is a special box it is $35 for subscribers and $40 for non-subscribers instead of the usual price of $21/box. The total value of the items in this box is $160 which is 4.5 times the cost of the box! If you think your mom or any other beauty lover in your life would like to try these items, click the image below to purchase this limited edition Glossybox!